Gastric bypass is a surgical procedure for treating morbid obesity. This procedure is only suggested after failure to lose weight by other conventional methods. Obesity is considered a grave problem and is the leading cause of various other diseases. Morbid obesity affects the quality of life of a person greatly. In severe circumstances, doctors suggest highly obese people to undergo surgery. The gastric bypass procedure involves the division of stomach into a smaller and a larger pouch, which are then connected to the intestine. In this procedure the function and storage capacity of the stomach is greatly altered. 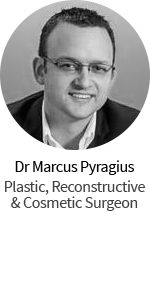 This procedure is a restrictive one, meaning that it can limit the amount of food by offering a little space of its storage within the stomach. The gastric bypass aims to decrease the size of the stomach by approximately 90%. It becomes so small that is it becomes able to hold only 400 mL of storage. The gastric pouch is created from the stomach part, which is least vulnerable to stretching. With the passage of time, the pouch restores its functionality, which point in time has achieved optimal weight loss. The physiology of the procedure works like this: as the patient eats, the amount of food when it enters the stomach leads to stretching of the stomach walls, this stretching sends a signal to the brain and the brain in turn enables the person to achieve satiety or fullness earlier. People who fail to reduce weight by dietary methods, medicines or exercises. The gastric bypass is carried out in the following way. A surgeon creates a small pouch from the lesser curvature of the stomach. It is the size of a thumb. It encloses approximately 400 mL of storage. Therefore, with only this amount of food storage space in the stomach an individual can easily achieve weight loss. A stomach can simply be divided or partitioned by the help of staples. It is must to do a total division to lower the risk of fistula formation as sometimes two stomach sections may joined and healed together. The other process involved is the re-construction of the gastrointestinal tract that allows drainage of both parts of the stomach. There are various techniques for this and these also alter the food absorption and nutritional status. 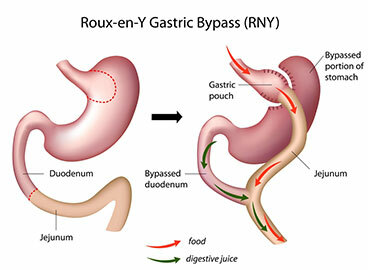 The most commonly used gastric bypass reconstructive surgery is named as Roux-en-y. It can be done proximally or distally. This is a laparoscopic procedure but it can also be carried out via a laparotomy. In proximal procedure the small intestine is incised about 45 cm below the inferior part of the stomach and is reorganized into a Y-configuration. This configuration enables steady food flow from the small upper stomach pocket through a Roux limb. In distal procedure the Y-connection is created much nearer to the distal end of the small intestine. This can reduce the malabsorption. In the Mini gastric bypass a long tube is formed along the lesser curvature of the stomach. The loop of the small intestine is joined to this tube at some distance from the ligament of Treitz. It has been found out in extensive research that a mini gastric bypass is safer procedure than other weight loss surgical options. It is an alternative procedure to the Roux en-Y gastric bypass. There are low risks of complications associated with it. Leakage of gastric contents though the staple: This leakage then serves as a source of infection and can lead to serious consequences. Anastomotic ulcer: It may occur in a few people due to poor blood supply to the area of anastomosis, gastric acid secretion, or due to infection by Helicobacter pylori bacteria. Dumping Syndrome: This syndrome is also seen after the gastric bypass procedure. It is characterized by the nausea, diarrhoea and reflux. It takes place when a person eats a sugar containing food. Q. When is gastric bypass regarded as successful? A. Gastric bypass is regarded successful when it enables a person to lose about 50 percent of their body weight. 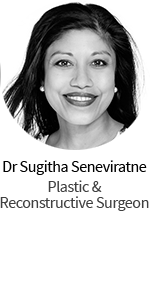 It’s vital to bear in mind that there are no assurances with any surgical procedure of weight loss. Q. What are the restrictions related to diet after the weight loss surgery? A. After the surgery, you will be directed about your food intake, depending on your body needs. Registered dieticians will provide you dietary education prior to and following surgery. Q. Is it possible to get back the weight again? A. It is possible as gastric bypass is not a curable procedure. It therefore requires that you stay away from fat-causing foods such as carbonated and caffeinated beverages, fast or junk foods etc. Q. What will happen to the portion of the stomach that is unused? A. The dormant segment of the stomach will continue to carry on its function of producing gastric enzymes and acids. It won’t impact your health in a negative sense. Q. What are the activities that should be restricted following gastric bypass? A. Strenuous activities are usually restricted after surgery. You are recommended not to drive if you are using any painkillers of a sedative nature.